Birding News: Rare sighting of a Pine Bunting in Uplands Park. October 2018. Uplands Park is attracting birders from all over to see a pine bunting.. never before seen in this part of the world. 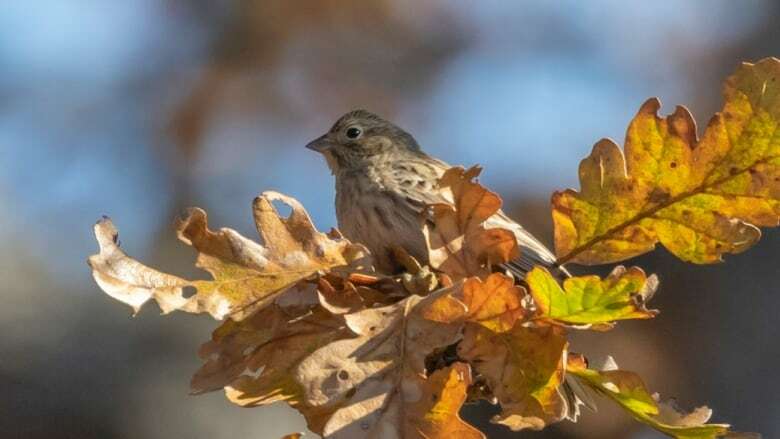 The bird, which is native to temperate regions across Asia, was spotted in Uplands Park in Oak Bay in the Greater Victoria area. It’s thought to be the first sighting in B.C. Uplands Park: The Great Rip Off Photos from October 14, 2018. 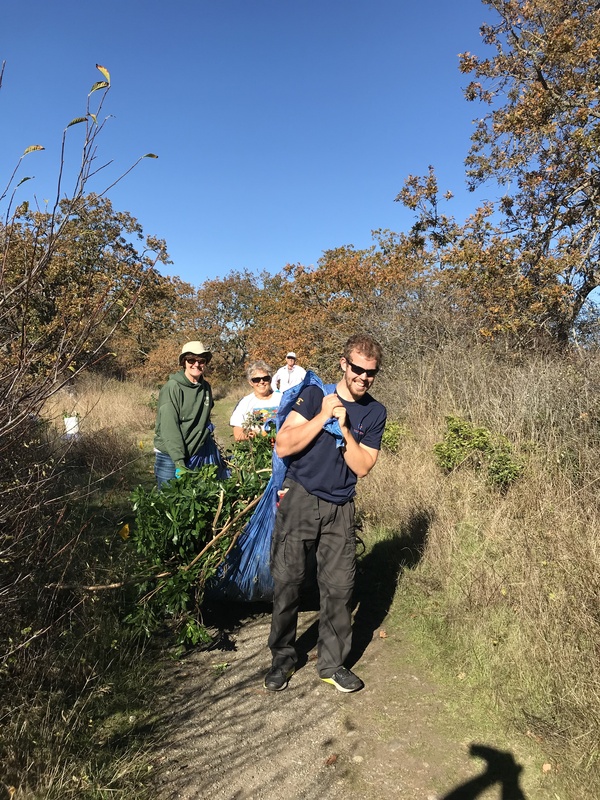 Thanks to all the volunteers who came out to The Great Rip Off in Uplands Park on October 14th, 2018. Another beautiful day in the Park and more great mounds of ivy collected. Photos by Ron Carter [first two] and Wylie Thomas [next 6]. Uplands Park: The Great Rip Off Photos from October 13, 2018. Join in the fun on Sunday, October 14th, 2018. 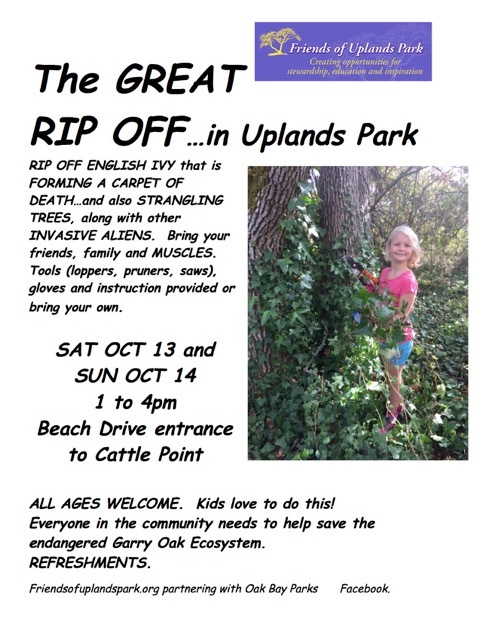 Thanks to all the volunteers who came out to The Great Rip Off in Uplands Park on October 13th, 2018. Such a beautiful day to be in the Park and great mounds of ivy were collected. For those who missed all the fun today, it is all happening again, Sunday, Oct 14th, from 1-4pm. Meet at grassy entrance to Cattle Point on Beach Drive. Tools and gloves and snacks. Family friendly. Hoping some Oak Bay Council Candidates show up too. Photos by Kathleen Matthews. 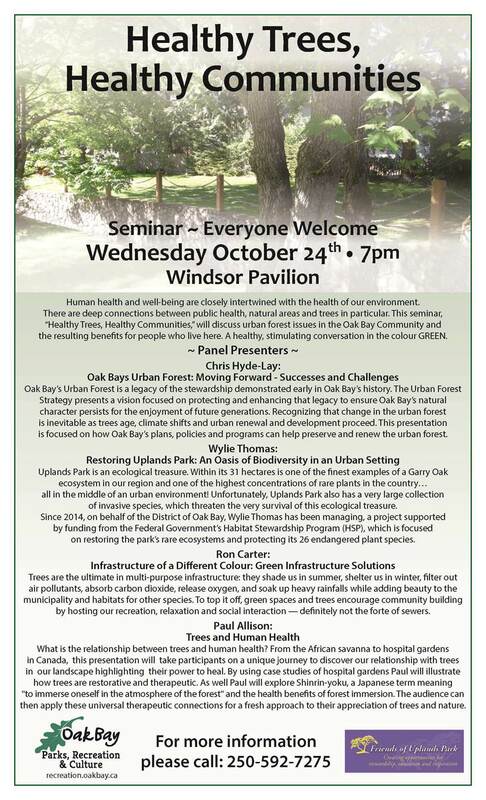 Seminar: Healthy Trees, Healthy Communities. Wednesday, October 24th, 2018. 7pm. Windsor Pavilion. 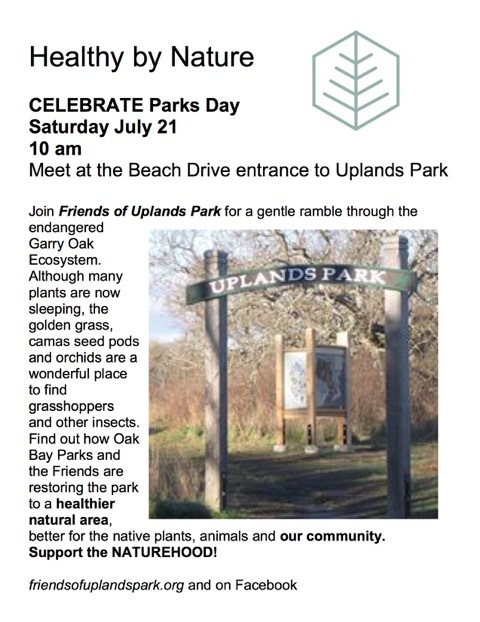 [Oak Bay – Windsor Park] Everyone Welcome. See poster for details and program. PDF of Poster. healthy_trees_healthy_communities_2018. 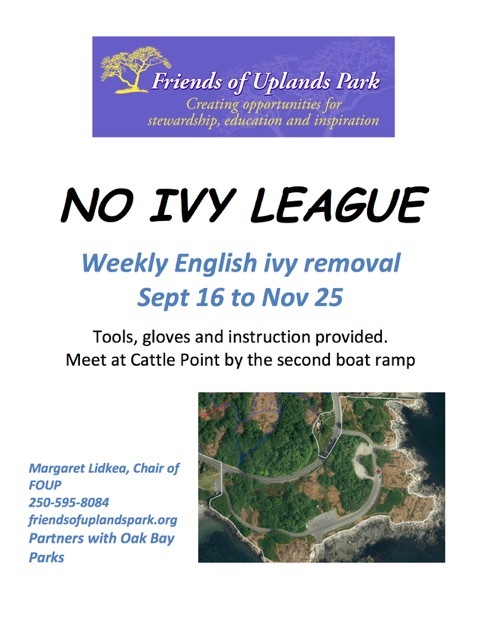 Sept 16 – November 25: Meet at Cattle Point by the second boat ramp. Tools, gloves and Best Practices instruction provided. A huge thank you to 2 Willows School students, Henry and George Mepham, for removing more than 10 kg of dog poop from Uplands Park. 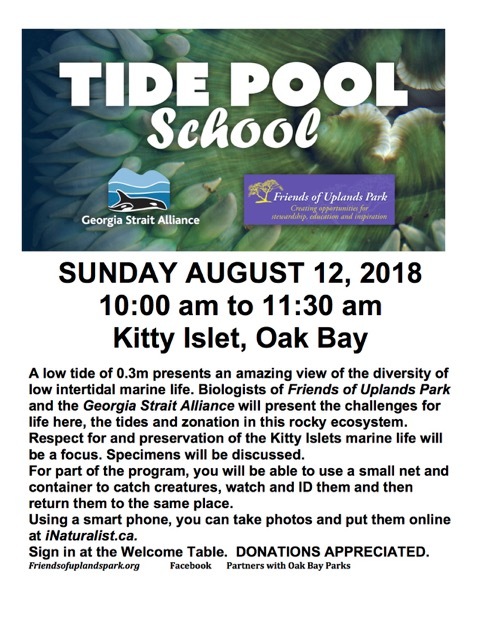 The article is in the Wednesday, August 22, 2018 issue of the Oak Bay News. In the print edition, see the front page and page A4. 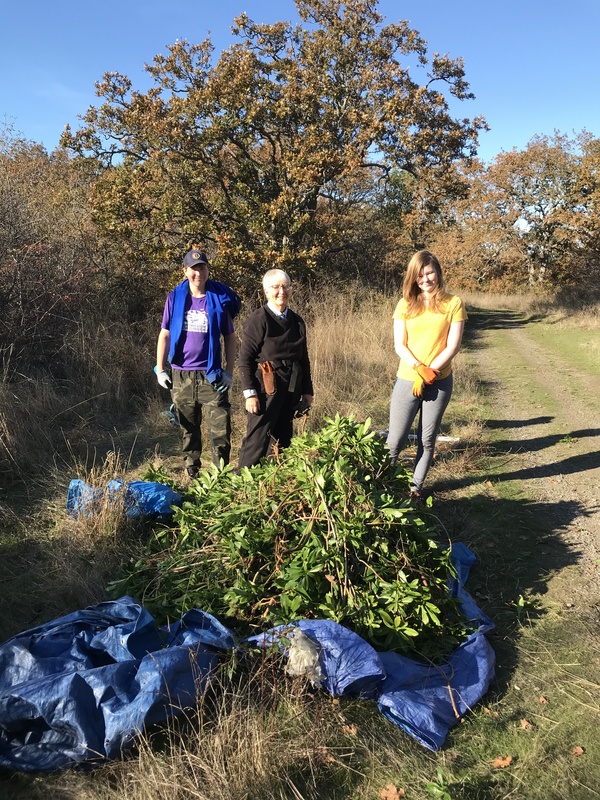 The online version, with more photos, and a short video, can be read at https://www.oakbaynews.com/…/oak-bay-brothhttps://www.oakbaynews.com/community/oak-bay-brothers-scoop-10-kg-of-poop-from-park-paths-in-30-mins/ers-scoop-10-kg-…/.Henry and George have also helped remove invasive plants in Uplands and have planted native species with their class. Photo by Christine van Reeuwyk/Oak Bay News. Published in the Wednesday, August 22, 2018 issue of the Oak Bay News. From page photo.